What Is Forensic Intelligence Analysis? Introduction—Why Do We Need Risk Management? What Are Standards of Competence? What Should a Standard of Competence Do? How Are National Standards of Competence Developed? What Should Standards of Competence Look Like? How Can Competence Standards be Used? How Can You Measure Ongoing Competence? The Eclipse of Adversarial and Inquisitorial Procedure? Professional Issues in Forensic Science will introduce students to various topics they will encounter within the field of Forensic Science. Legal implications within the field will focus on expert witness testimony and procedural rules defined by both legislative statute and court decisions. These decisions affect the collection, analysis, and court admissibility of scientific evidence, such as the Frye and Daubert standards and the Federal Rules of Evidence. Existing and pending Forensic Science legislation will be covered, including laws governing state and national DNA databases. Ethical concerns stemming from the day-to-day balancing of competing priorities encountered by the forensic student will be discussed. Such competing priorities may cause conflicts between good scientific practice and the need to expedite work, meet legal requirements, and satisfy client’s wishes. The role of individual morality in Forensic Science and competing ethical standards between state and defense experts will be addressed. Examinations of ethical guidelines issued by various professional forensic organizations will be conducted. Students will be presented with examples of ethical dilemmas for comment and resolution. The management of crime laboratories will provide discussion on quality assurance/quality control practices and the standards required by the accreditation of laboratories and those proposed by Scientific Working Groups in Forensic Science. The national Academy of Sciences report on Strengthening Forensic Science will be examined to determine the impact of the field. Professional Issues in Forensic Science is a core topic taught in forensic science programs. This volume will be an essential advanced text for academics and an excellent reference for the newly practicing forensic scientist. 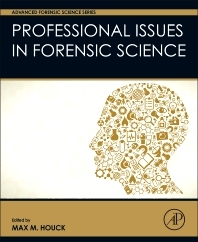 It will also fit strategically and cluster well with our other forensic science titles addressing professional issues.